Enjoy the beautiful pine interior, even in the modern bathrooms, and you have two full baths! The kitchen is fully-equipped with a microwave, blender, coffee maker, range, refrigerator, as well as all cooking and dining conveniences that you'll need. There's a lovely warm pond within a ten-minute drive, as well as world-class snorkeling in the tide-pools. A 10 minute drive will take you to Ahalnui Beach Park with its amazing 90+ degree geothermal-heated tide-pool. This is a safe and gorgeous place for the whole family. You're only five minutes to unique Pahoa Town, which is a step back in time. You'll find many very good restaurants to choose from and a 'Real Hawaiian' atmosphere! You'll love this place. Remember, you'll be close to the volcano, and you won't want to miss seeing Kilauea in action! More on location . . .
We're on the Hilo side, about a 25 minute drive south of Hilo. Normal weather is beautiful all day with the occasional rain-squall to cool things off, and then it often rains at night to keep your garden fresh and green. We also enjoy what is reputed to be the cleanest air on the planet... What you do get here is rural Hawaii at its best. You get to experience the most beautiful, unspoiled tropical surroundings imaginable. From languishing in the geothermal heated warm pond (five minutes away) to snorkeling in our crystal clear tide pools or taking a short ride down to beautiful Kehena Beach, you will be richly rewarded with taste after taste of our roads less traveled. Our nearest town, Pahoa, is a quaint little village that time seems to have forgotten. You'll find Old-West style buildings with wooden sidewalks dating back 100 years, and a great variety of resources for residents and travelers alike. No tourist trappings here, either, but we do have some of the finest restaurants on the Island. Thai, Tuscany Italian, natural-foods, bueno Mexican, and the best 'hole-in-the-wall' take-out Chinese that you can imagine! Funky ambiance with a delightful surprise of wonderful cuisine. We have a Sunday Farmer's Market that sometimes features live music, and just the people watching is worth the trip. It's as much a social event as a marketplace. Of course, you can also find about every kind of local veggie and fruit, plus a lot of prepared offerings, too. And just in case you're in the mood, how about an open-air massage? If you would like to venture out and explore more of the Big Island from here, you can take some day trips to Volcanoes National Park, Waipio Valley, beautiful and friendly Hilo town or even a scenic two and a half hour drive to Kailua-Kona on the other side of the island. Also on the other side of the Island, the coastline from Kailua Town up to Hawi (at the northern tip of the Island) has some of the most fantastic white sand beaches you'll ever see, and Hawi is a very special artist's community featuring some of the best galleries and the famous Bamboo Restaurant. The Island also has abundant hiking trails with all sorts of spectacular destinations. I built this home in 1994. It was the first of three. It is very homey and as my local friends say it is ohana. 7 miles to the shore. Free local calls, local long distance, calls to the mainland and Canada. Living Room has seating for 5. Roku box for streaming of Netflix (included) and several other subscriber services. Swimming Pool is located up at the Nanawale Community Center. 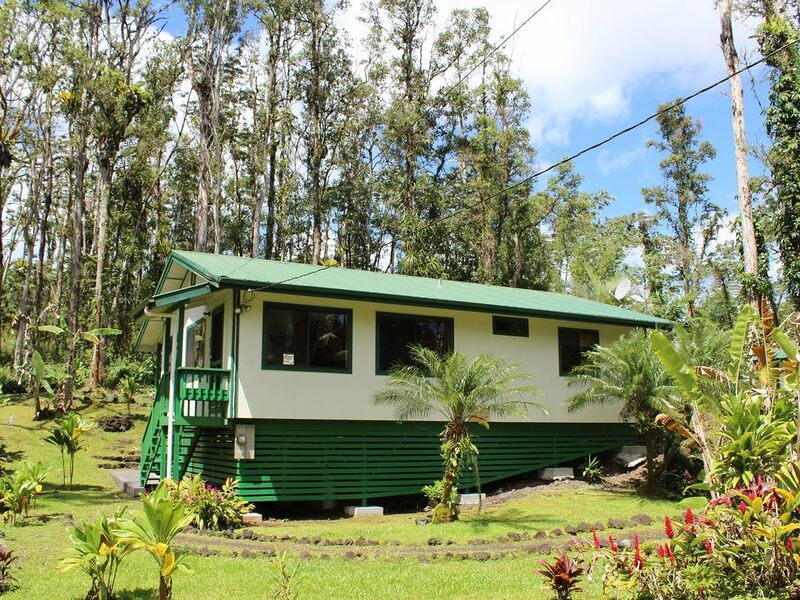 VERY Private Setting in a Hawaiian Tropical Forest, Beautiful Pine Interior - Light & Airy! This Hale is more than described. It is secluded, quiet, and peaceful yet easy driving to all the sights. We were amazed at the details of the construction of this hale. It was obvious it was built with love. It was immaculately clean. Also very comfortable furnishings. It was a pleasure to communicate with the owner. Very professional, helpful , and prompt with all arrangements. When I return to Big Island this will be my first choice for rental. Pahoa town is just 4 miles away with restaurants, groceries, shopping, a post office, police and fire stations and live entertainment. Volcano National Park is just 40 miles away with great hiking and sight seeing. Hilo is 25 miles away with shopping, dining and several beautiful beach parks. Monthly renters are responsible for any amount over $200 per month for electricity.